60 pop-up exhibitions await you across Chiswick, Hammersmith and Shepherds Bush. 76 artists will be delighted to welcome you to their houses, studios and flats, to view paintings, glass-making, ceramics, printmaking, sculpture, photographs, textiles, and jewellery. 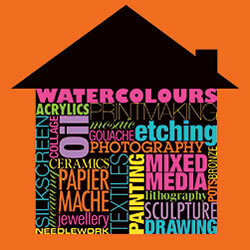 This is an exciting chance to discover new original work for your home and to talk to artists about how they create. A fun and lively event with many regular addicted visitors. If you've never been before, make this the year you visit. Browse the artists you can discover on the find art page and learn more about Artists At Home in the section about the event, or use our interactive map of all studios. "Nice to see work in friendly, intimate surroundings, a delightful way to spend an afternoon or a morning"
"I always look forward to Artists at Home, it's good enough to go back and back"
"I enjoy chatting to the artists who made the work and always come away feeling inspired"
"Better than buying from a gallery"
Create a shortlist of your favourite artists to help you plan your route. And we'll send you an email reminder near the date. Sign up below!